Teach the Beat Seminar — Teach the Beat! “I’m going to start using go-go to teach across the curriculum, connecting DC history, math, and music. 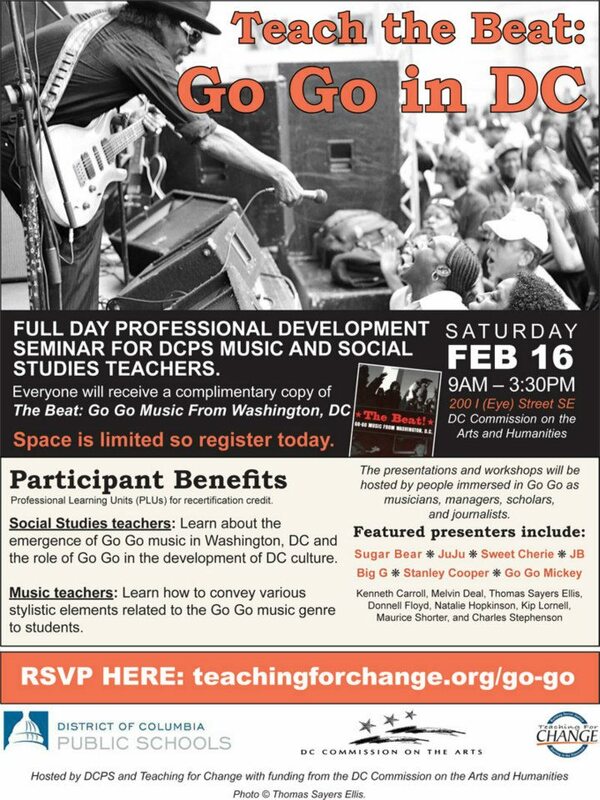 This was the best professional development ever,” said one of the participants in the groundbreaking full day seminar for DC teachers called Teach the Beat: Go-Go in DC on Saturday, February 16, 2013. Close to a hundred music and social studies teachers took advantage of the unique opportunity to learn from the leading luminaries and scholars in go-go including Christopher “Geromino” Allen, Sugar Bear, JuJu, Sweet Cherie, JB, Stanley Cooper, Kenneth Carroll, Melvin Deal, David “32” Ellis, Thomas Sayers Ellis, Donnell Floyd, Natalie Hopkinson, Kip Lornell, Maurice Shorter, and Charles Stephenson. Two representatives of DC Public Schools, Ben Hall (Director of Music) and Scott Abbott (Social Studies Specialist), took the lead on planning the seminar. They recognized that DC is one of the few cities in the country to have its own particular musical and cultural institution that spans decades and generations, yet go-go is not part of the DC history textbook. They also noted that while the early days of go-go were nurtured in DCPS music programs and school bands, music teachers new to DC often do not know how to play or teach go-go nor anything substantial about the genre. With the goal of having go-go as central to the curriculum as it is to the city, Hall and Abbott partnered with the authors (Charles Stephenson and Kip Lornell) of the first book on go-go (The Beat!) and the non-profit organization Teaching for Change to develop a plan for professional development, curriculum development, and classroom coaching by performers. Last fall the DC Commission on the Arts and Humanities agreed to provide funding and host the first teacher seminar on February 16. The significance of the day was underscored with greetings from Nekos Brown, the son of the godfather of go-go, Chuck Brown. He said, “For DC to embrace go-go in a classroom is huge, because there was a time when go-go was looked down upon because of the violence. This is the highest honor." DC Commission director Lionel Thomas and program officer Carlyn Madden welcomed the group to their beautiful new building and exhibits. Ben Hall and Scott Abbott stressed the commitment of DCPS to infuse go-go in music and social studies classes. Duane Arbogast, acting chief academic officer in Prince George’s County, shared his interest in taking this to PGCPS to promote local, culturally responsive teaching. Renowned go-go performer JB provided an introduction to the history and key aspects of go-go music. Then participants got out of their seats for an interactive Gallery Walk on themes and issues in go-go, a lesson they can use in social studies and language arts classrooms. The music teachers rotated to three small group workshops with the performers. The social studies teachers field-tested a role play designed to introduce students to the people, bands, and issues in go-go. They then heard from a panel facilitated by Kenneth Carroll on history, politics, economics, and the media with respect to go-go. 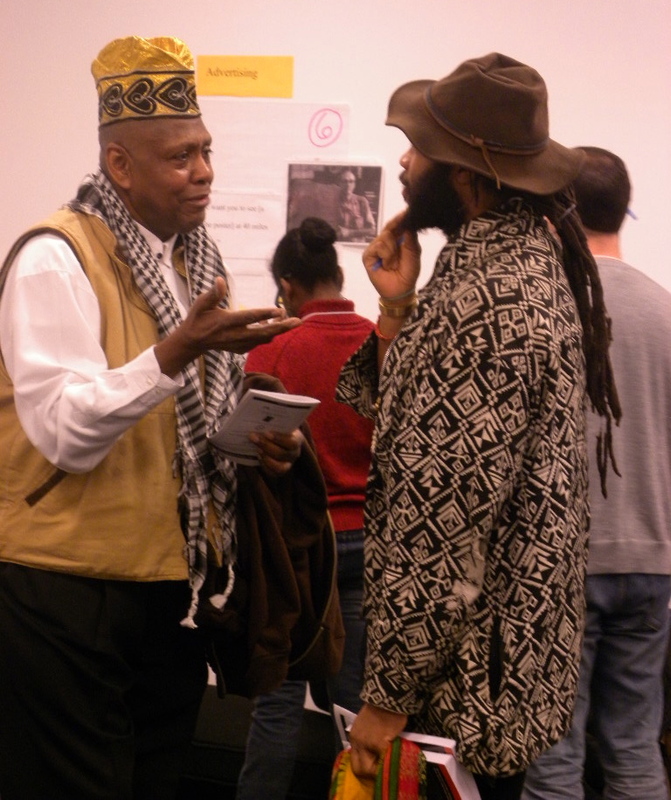 In addition to the presenters, many of the participants had their own stories to share about go-go history, culture, and teaching. The day culminated in a live go-go performance with all the musicians and attendees. This not only ended the day on high-spirits, with everyone swinging their hips and taking photos, it also gave those teachers who are new to DC a first-hand understanding of the spirit exhibited by go-go, which defies explanation in words. The partners who planned the event are committed to sustain the powerful momentum of the day. The lessons, prepared by Teaching for Change consultant Marya McQuirter, will be posted on the website thebeatisgogo.com and funds are being raised to bring the performers to schools. As Nekos Brown left he said, "For me, this is like how we now have a Black president. The program was put together so nicely and the idea of putting go-go in class is amazing. I don't think anybody imagined that happening." The Washington Post reported, “On Saturday, go-go musicians taught social studies and music teachers from D.C. public schools how to lace the city’s signature sound into their lesson plans, an effort to celebrate the students’ cultural heritage, and better engage them in class.” Read more. The Examiner reported, “The culmination of the event was a live performance, the only true method of capturing the true feeling of Go-Go, where every single teacher was dancing in the aisles like they were at the Maverick Room, Chapter III or Cheiry’s back in the day.” Read more. Film excerpts from the February 16 Teach the Beat Seminar, produced by DC Public Schools. This event was funded and hosted by the DC Commission on the Arts and Humanities. More photos, stories, and follow-up plans will be shared soon. Download a copy of the program.